On Monday, May 14th, 2018, The Eichholz Law Firm held an event to celebrate the winner of The Eichholz Law Firm Scholarship for Higher Education award. Natreece Brooks, a senior at Windsor Forest High School, was in attendance to receive her award and $1500 scholarship. Natreece will be attending The University of Georgia this fall with a major in chemistry and minor in biology and plans to be an Obstetrician-Gynecologist. We also presented one of our runner-ups, Jasmine Lin, with her $250 gift card. 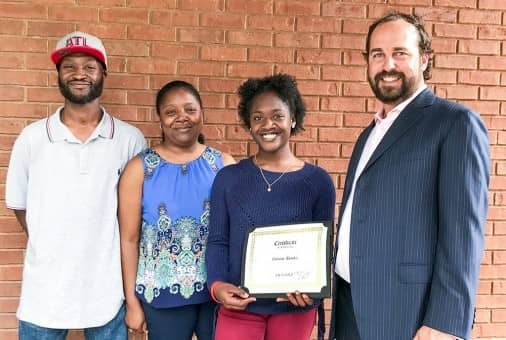 Jasmine was chosen due to her work starting an after-school piano club for elementary students while maintaining a 3.9 GPA at Savannah Arts Academy. She will be studying at Emory University and wants to become a physician. WTOC News joined us for the award ceremony and will feature it on WTOC later this week, to share Natreece and Jasmine’s success. Natreece was very excited about receiving the scholarship, and to be recognized for her achievements. She had many late nights working hard to keep her 4.0 GPA, and also worked part-time at Wal Mart. Congratulations to Natreece, and our runner-ups Jasmine Lin, Mallory Morgan and Aidan Sutherland!